Steve Evans celebrates Posh's victory at Charlton. Photo: Joe Dent/theposh.com. 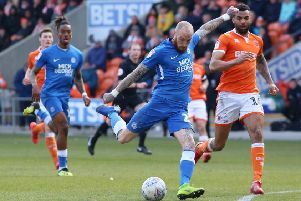 Peterborough United manager Steve Evans insists he will never change his touchline behaviour, even though he fell foul of the new Football League rules covering managerial discipline in last night’s volatile clash at Charlton (August 21). Evans was shown a yellow card at half-time for ‘inappropriate behaviour towards a match official’ at the Valley. Multiple yellow cards can lead to a ban this season. The Posh boss didn’t let the card spoil his mood after a hard-fought 1-0 win courtesy of Jason Cummings’ 89th minute penalty kept Posh at the top of League One with a perfect winning record over four matches. “I’m too old to change now,” Evans stated. “I’m a passionate man who cares about my club and my players. I hope that’s what comes through. “I would say 95% of my comments are aimed at my players. I am not disrespectful of officials and I never swear at them. My booking at Charlton was for asking questions about the lack of protection for Siriki Dembele and the referee said they were inappropriate comments. I will always defend my players if I feel they are not getting fair treatment.